Sunday morning. Door County, Wisconsin. The Door County Beer Festival is complete. Coffee at my fingertips, a sunburnt forehead, and I'm ready to get this day started. Last week SMAK started a weekly series on coffee with a quick overview on storing your coffee and the four different factors that may play into the taste of the coffee you're brewing. 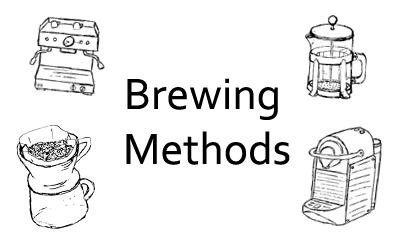 Today we'll take a quick look at a number of the different brewing methods that you can choose from. 1. Pour Over: This is a great solution for someone who wants to make just one cup of coffee. This method allows you complete control of the flow of water, and ultimately, the depth of flavor. 2. French Press: Here is the absolute winner in my books. Using a coarse grind, this brewing method releases the coffee's oils directly into your cup of coffee rather than into a filter. The result? An amazingly rich and flavorful cup of coffee. 3. Coffee Brewer: This is the standard for coffee brewing. Unlike a pour over, a coffee brewer allows you to make larger batches of coffee. These machines use either flat bottom or cone filters, so be sure to specify which filter you use when buying coffee for your barista to give you the correct grind. 4. Espresso Machine: I've found that most people tend to steer clear of this brewing method. Friends have come to my apartment, seen my espresso machine, and said, "Woah, you're obsessed with your coffee aren't you?" Yes, I am, but making espresso in the comfort of your own home is not as difficult as one may seem and could help reduce money spent at Starbucks! 5. Pod Brewers: I have to be honest, I have my hesitations about this brewing method. I like my coffee strong and I like the process of making a cup of coffee. Ultimately, I feel pod brewers remove the fun from making your cup of coffee in the morning. There are three main players in this field: Starbucks Verisimo, Keurig and Nespresso. Next week we’ll take a deeper look at these machines. Chicago coffeehouse, Intelligentsia Coffee, has an awesome website with instructions for a number of different brewing methods, including some of the ones seen above. What is your go-to method? Any good, bad, or ugly experiences with any of these methods?